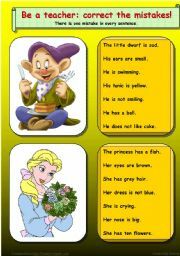 A ws for young learners to practise pronouns he/she/it/they, have/has and use of the indefinite article. This is Part 2 of the board game What Fruit Is It. It�s editable, so you can easily remove the background colour if you wish. The student has to correct mistakes in the description. 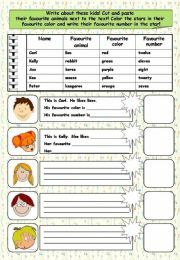 This worksheet can be useful for practising and revising beginner�s vocabulary, is/is not and pronouns he/his, she/her. It is editable to adopt to your needs. 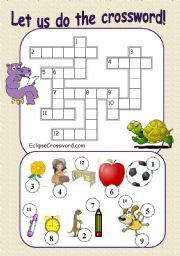 A crossword for the little ones. There are 12 simple words to write. 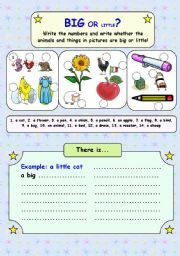 This worksheet is made for practising beginner�s vocabulary, especially the words big and little, and writing skills. See also Part 2 of this worksheet. Sorry, I wasn�t able to unite them in one file. This is Part 2 of the board game What Animal is It. It�s editable, so you can change the background colour easily. A Game IS or HAS? He/She, His/Her. What are their favourites? 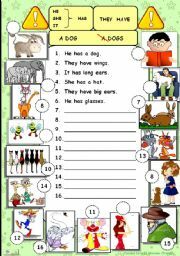 A ws for young learners to practise he/she likes, his/her favourite animal, color, number is... They will have to cut and paste animals (they are on the second page) accordingly and color the stars. It is fully editable. Enjoy! These are flashcards for the Guest Game Part 1. Sorry, I wasn�t able to put them in one file. The presentation is created to practise �there is�, �there are� sentences. For example, a student has to comment the picture: there are cards in boy�s hands, there is a lizard on the sofa, etc.